Apart from the fact the same foods are often called very different things, the style of eating between British English speakers and Americans differs vastly. In the Commonwealth, one does NOT eat with just a fork… The knife remains in the right hand and the fork in the left. In the USA the knife is used to cut up the meat, after that, the knife is returned to the table, the fork placed in the right hand and the rest of the meal consumed with a fork only. In fact many meals such as salads are served with only a fork, very confusing for people used to using both implements for all meals. In the Commonwealth French Fries (chips) are eaten with a knife and fork and NOT one's fingers - except perhaps in a pub or fast food outlet.. Americans always use their fingers for fries even in up market restaurants. And while on the subject of chips or fries - in the USA chips are always called fries unless they are served with battered fish, then and then only, are they called "fish and chips" - go figure THAT one out!! Hamburgers in America are eaten whole with one's hands. In some Commonwealth countries, it would not be unusual for a diner to remove the top half of the bun and eat the balance of the hamburger with a knife and fork. This is not so much at a fast food place such as McDonalds, but more you would see this at a fancier restaurant that serves burgers. Most Americans when it comes to a barbecue, cook on propane grills, while most Commonwealthers cook on charcoal. Hamburgers and hot dogs are cooked more often than other meats in America. 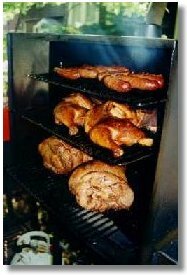 There is group of Americans that are more purists, who consider barbecue to be slow cooked meat with usually a BBQ sauce. The meat usually cooked is pork such as ribs or shoulder or chicken or beef. The barbecue purists tend shun gas in favor of charcoal. Very common in the UK, fish and chips are bought from "chippies" and eaten out of the paper with your hands. There is a chippy in every village sometimes 2 or 3! A continental breakfast in the Commonwealth would be fruits, cheeses, a variety of pastries and cold meats such as sliced ham. In the USA a continental breakfast is coffee and donuts/pastries! Americans take their coffee VERY seriously and the thought of drinking instant coffee is about as appetizing as drinking toxic waste! Few US homes have electric kettles, while no home is without a coffee filter machine. In the Commonwealth, instant coffee is more common than it's filtered version and regarded as quite acceptable and would not raise eyebrows when served to guests. Tea, on the other hand, in the Commonwealth is a hot drink served with sugar and milk and is a daily staple. Tea in America is drunk cold with ice and sugar (ugh!!). The only warm tea Americans drink is herbal tea (which incidentally they pronounce: 'erbal). Tea time (approx. 11am and then again 3pm) is still observed in the Commonwealth. Tea and snacks such a biscuits or scones are served. Coffee and other drinks are also served these days. Americans truly have a "throw away" society. Even the best hotels will sometimes serve coffee in disposable cups and the teaspoons are no more than plastic straws. Restaurants however will serve coffee in mugs. Certainly saucers are NEVER provided. In the Commonwealth only fast-food outlets use styrofoam (polystyrene) and plastic silverware (cutlery). Americans by the large do not use chop sticks at Chinese restaurants. Most Chinese restaurants automatically provide forks or spoons on the table and chop sticks have to be ASKED for. The reverse is the case in the Commonwealth where spoons and forks are only provided on request. American restaurants are almost without exception "eat, pay and get outta here" establishments. A table would be typically turned over 5 or 6 times in an evening. Starters (appetizers) are rushed out within 5-10 minutes of arrival and the main course is served immediately. The check is brought as soon as the plates are cleared. An average visit to an American restaurant is between 45 minutes and an hour. Once again this is a generalization, there ARE exceptions to this rule, so don't go writing nasty e-mails to me!! In the Commonwealth a group of friends going to a restaurant will invariably be there for the entire evening. 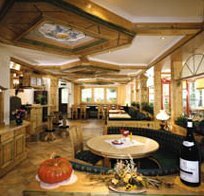 A stay of 2-4 hours in the restaurant would not be considered unusual. Main courses can be held back until the party calls for them - there could be as much as an hour break between courses. Once the meal is complete the check is seldom brought until the guests ask for it. Which could be a few hours later as the party will continue to sit, drink and socialize at the table, sometimes until the wee hours. In the Commonwealth it is normal to tip your server 10%. In the USA 15% is the norm and 20% in large cities such as New York. In Australia tipping is not the norm at all. In the USA you almost ALWAYS change or substitute items on the menu. This a is very acceptable and a common practice. IN the Commonwealth it is VERY unacceptable to change anything out on the menu and apart from being frowned on, most of the time your request will be refused. Dress in most restaurants in the USA is casual with shorts and T-shirts being the norm. In Commonwealth countries dress code is a little more formal such as smart casual except in bars and street cafes. Eating times differ greatly!! Americans prefer eating early in the evening and often will be found in restaurants having dinner at 5 p.m. In the Commonwealth restaurants only open their kitchens at 6 p.m. with most people only reserving tables from 7.30 - 9.00 p.m. Many USA restaurants all close by 10 p.m. In the Commonwealth it is not uncommon to be still in a restaurant past midnight! Lunchtime in the USA is 12 noon and in the Commonwealth it is 1 p.m. Copyright © 2006 Bruce Longman. All rights reserved. Web Design by Longman Computer Solutions.